Within an easy walk to Glasgow International Airport, situated just off the M8. There is a regular airport shuttle bus operating from the hotel and a nearby leisure complex with cinema, shopping and restaurants. Glasgow city centre is 12 miles away. 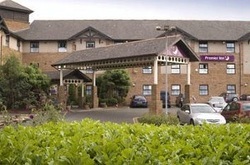 This Premier Inn has free on site parking and a Thyme restaurant serving quality fresh meals throughout the day. Book direct for the best Premier Inn Glasgow Airport deals.